It’s the home of top-notch (medical) research, and of well-known educational institutions: The North Carolina Research Triangle. The area consisting of Raleigh-Durham-Chapel Hill, is also where my parents live. This weekend, my boyfriend and I traveled from Boston to see them in Chapel Hill. Though we had limited (but a wonderful) time, we explored Duke Homestead and Tobacco Museum, walked on the campuses of Duke University and UNC Chapel Hill, enjoyed fried green tomato sandwiches at the historical Carolina Inn, and spotted Belted cows and goats at Fearrington Village! 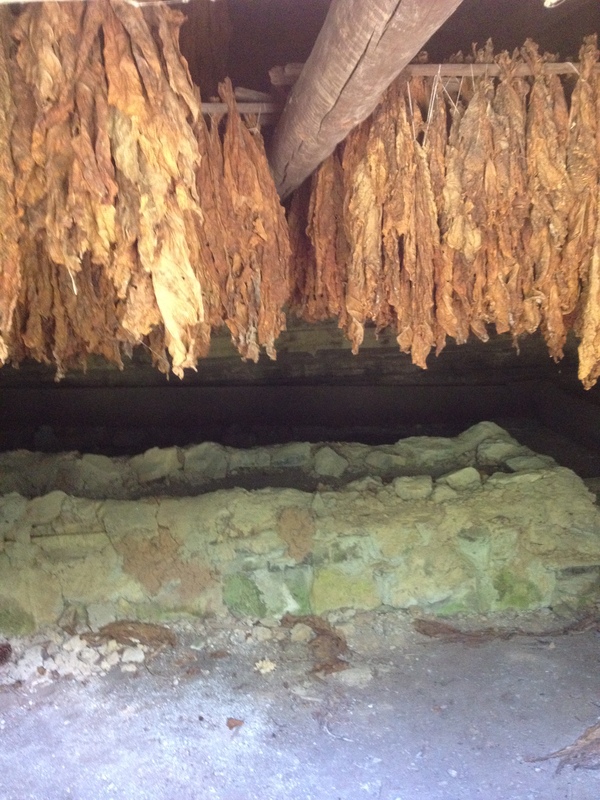 In 1852, upon arrival to Duke Homestead, Washington Duke, an Orange County farmer, began his passion for tobacco-growing. Duke focused on manufacturing of tobacco products, which were popular among soldiers fighting in the Civil War. Realizing the growth potential of tobacco, Duke opened a small factory and just a few years later, he was on to the third factory. Together with his sons in 1881, he established the W. Duke Sons and Company. The Dukes relied on the power of mechanical production of cigarettes, and extensively marketed cigarettes. “Since first introduced to early settlers by native peoples, tobacco has been a vital part of the economic heritage of North Carolina. During colonial times, bundles of this “cash crop” were used as currency. 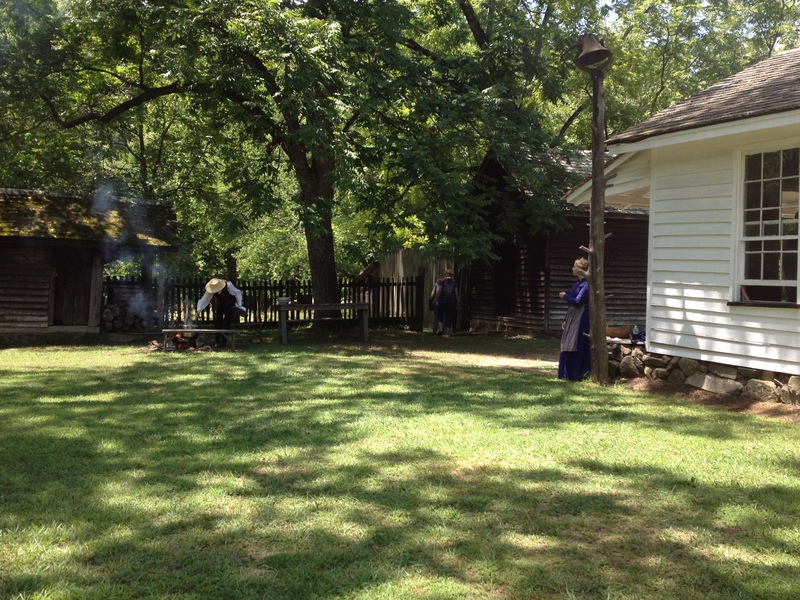 Today, over two centuries later, tobacco is still a leading export crop of North Carolina.” (North Carolina Historic Sites, Dept. of Cultural Resources). On July 14, we attended the Pork, Pickles, and Peanuts: Tastes of North Carolina event. While there, we sampled delicious BBQ pork sandwiches with coleslaw, and enjoyed freshly squeezed lemonade to cool off. 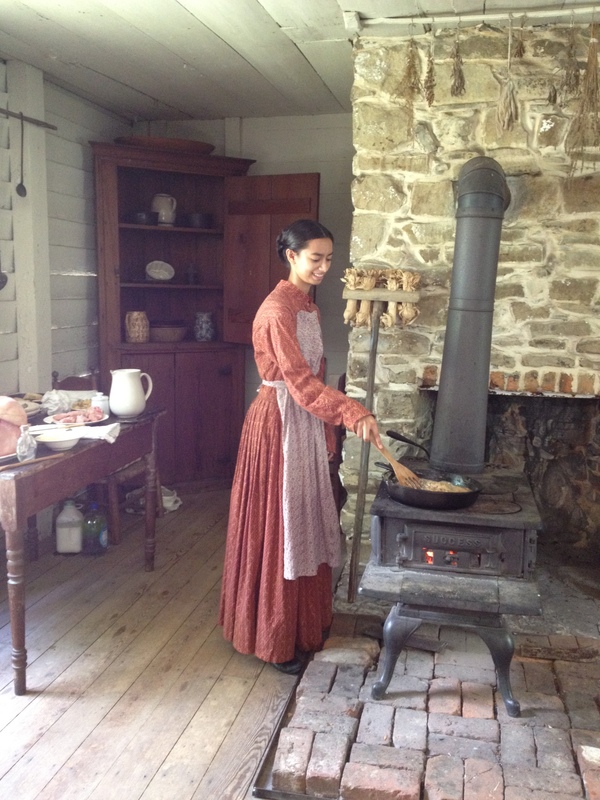 Preparing dinner inside Duke Homestead. 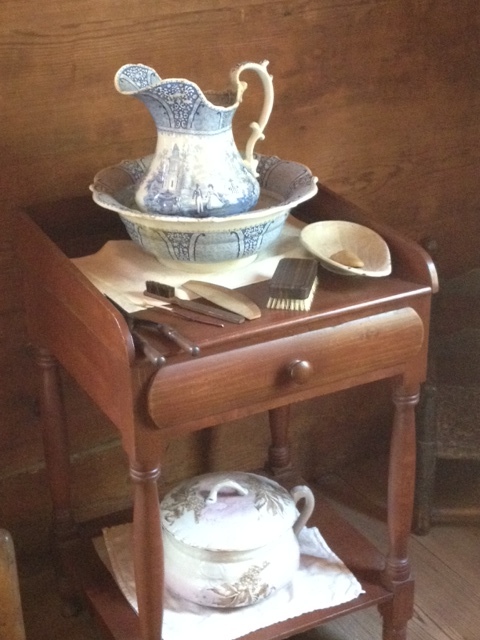 Part of the bedroom inside Duke Homestead. 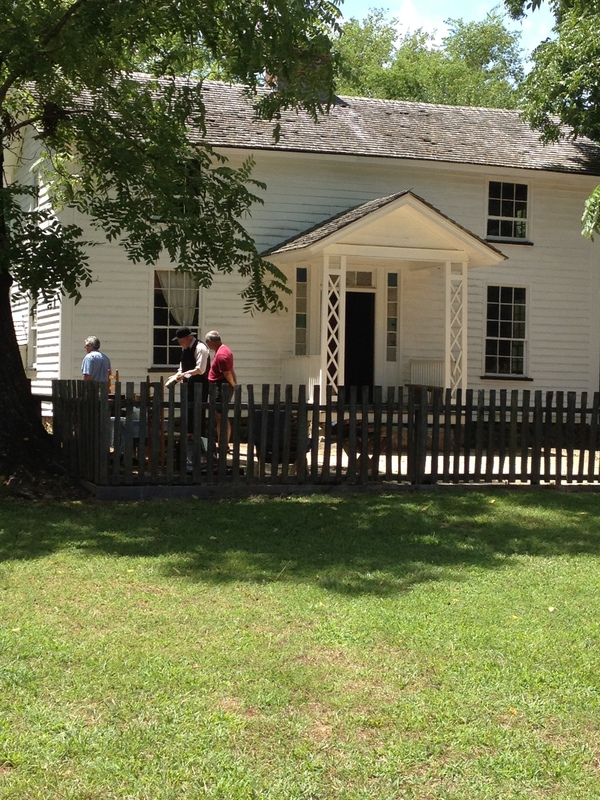 Exiting Duke Homestead, we heard an older gentleman playing the banjo. He played famous, older songs and discussed his passion for restoring the instruments, which dated back to 1830. 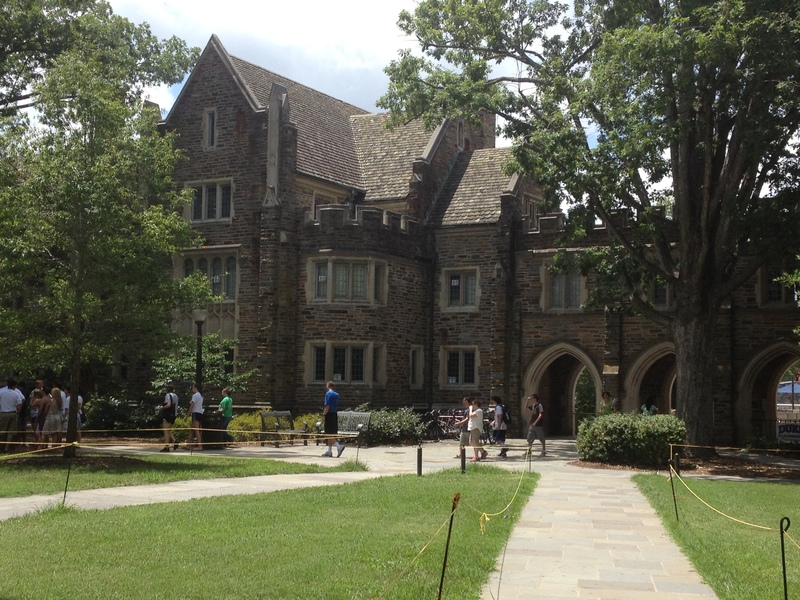 Named after Washington Duke, Duke University is a private, top-ranked university in Durham, NC. Its architecture is influenced by Georgian and Collegiate Gothic elements, and we thought it resembled Harry Potter’s Hogwarts a bit, too! 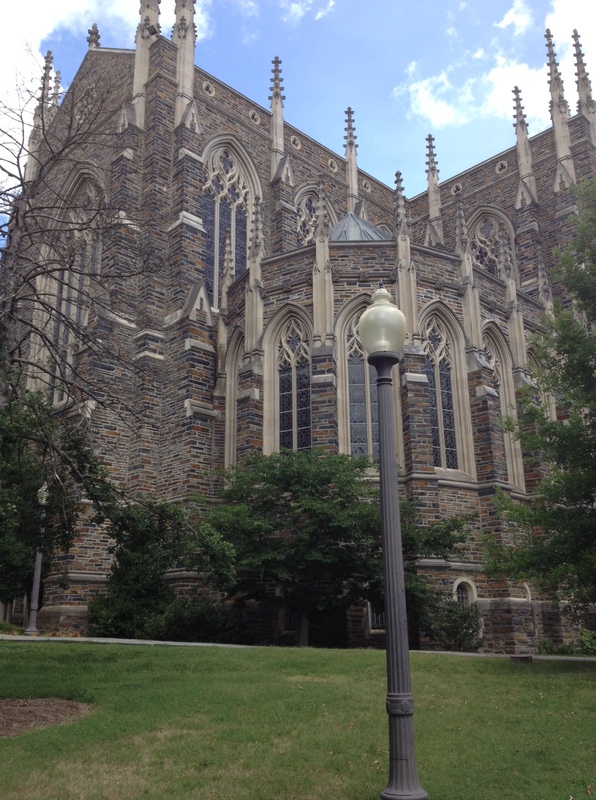 Constructed between 1930 and 1931, Duke Chapel has not only served as a place of worship, but also hosted famous speakers including former U.S. President Bill Clinton. 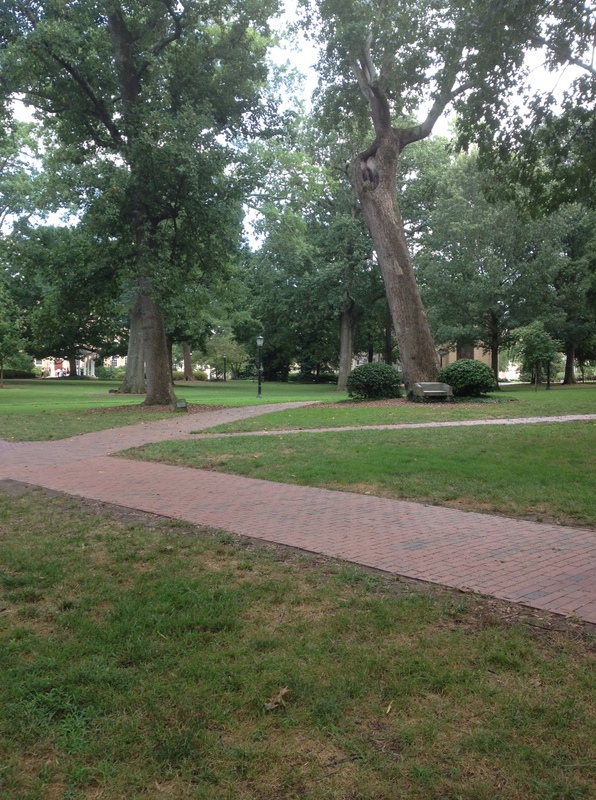 The more modern campus of the University of North Carolina Chapel Hill is among the oldest public universities in the country. Donning the Carolina Blue colors, UNC’s the Tar Heels have a history dating back to the Civil War. One UNC alum explains the origins of the name quite well. UNC and Duke have an intense athletic, and academic rivalry, that is particularly evident in basketball. A short distance outside of Chapel Hill lies the community of Fearrington Village created in 1974 in Pittsboro, NC. 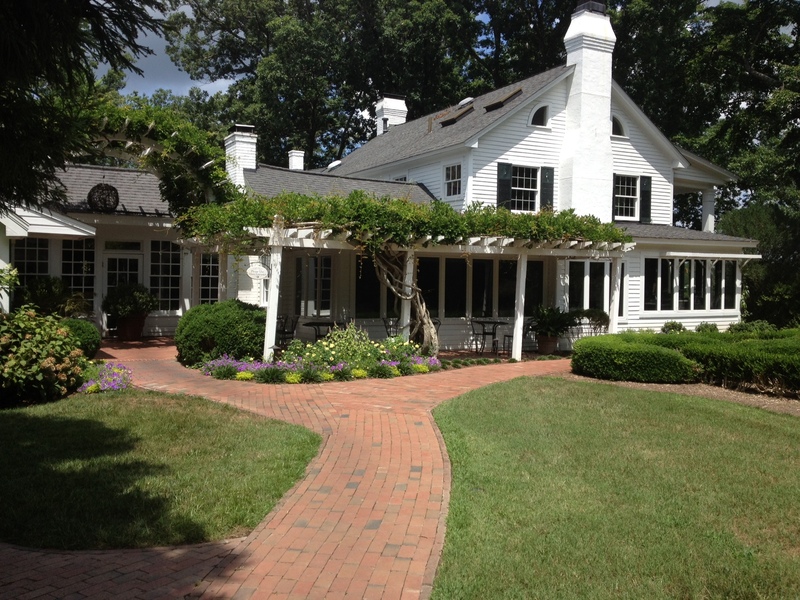 Surrounded my farm land, the village encompasses the Fearrington House Inn, little restaurants, shops, and apartments. It is a popular destination for parties, events, and wedding receptions through November. The Fearrington House. Pittsboro, NC. 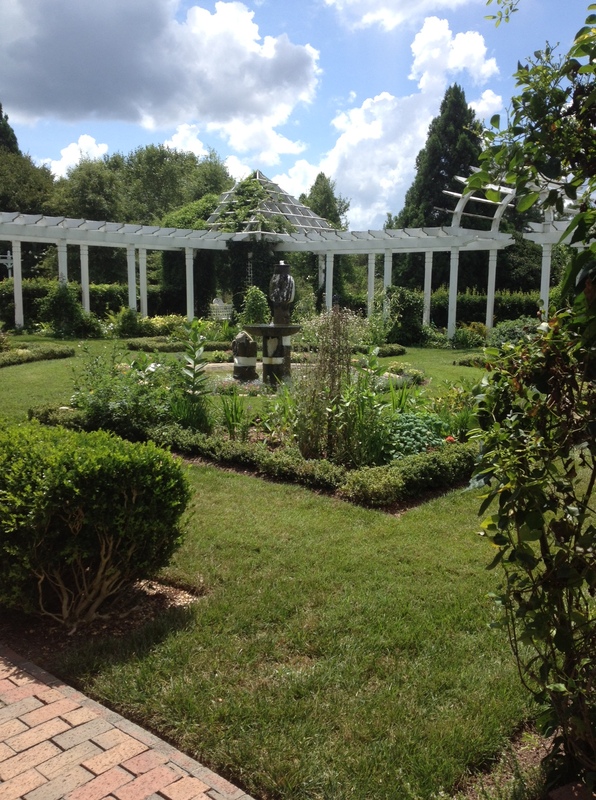 Gardens surrounding the Fearrington House. 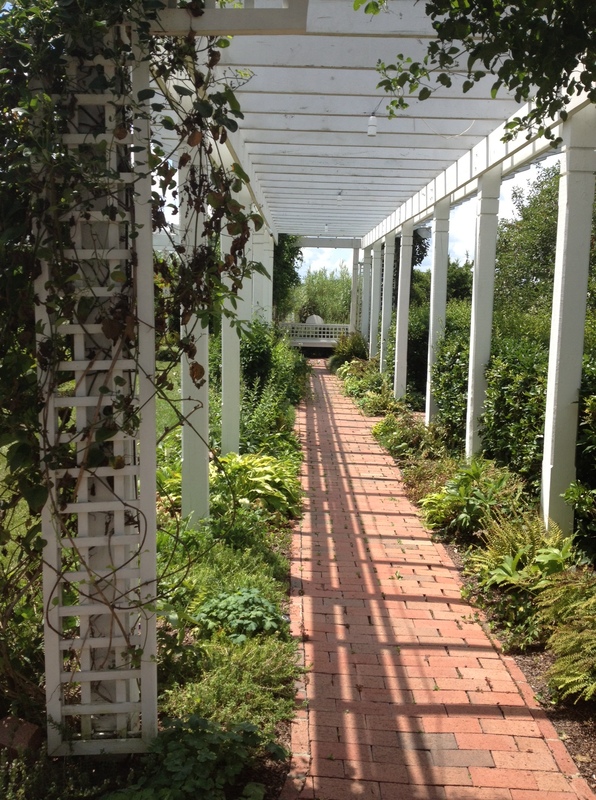 Garden by the Fearrington House. As you enter the village, its Belted cows, or “Oreo cows,” greet you. 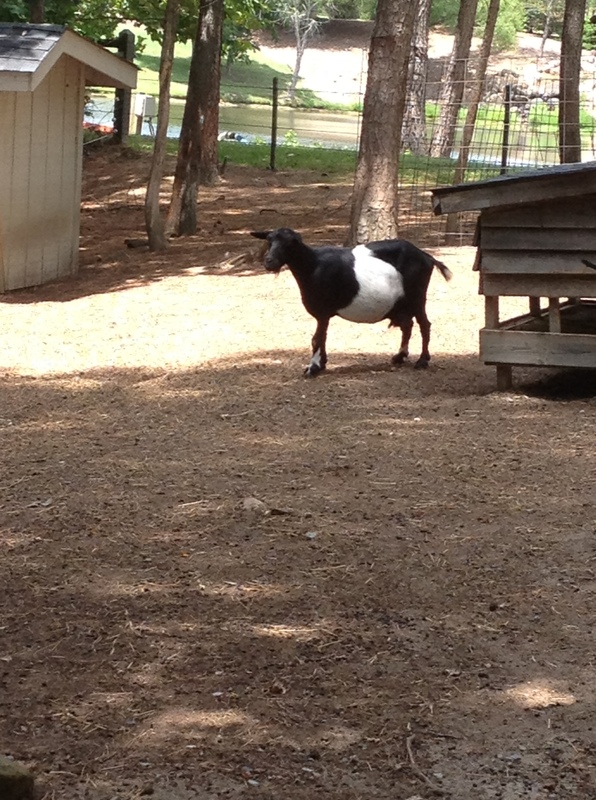 A little deeper into the village, you’ll also find Belted fainting goats – who, luckily when we saw them, did not faint! Belted Goats at Fearrington Village. Thanks for the bird’s eye view. That banjo guy looks exactly like Burl Ives as the snowman in Rudolf the Red-Nosed Reindeer! 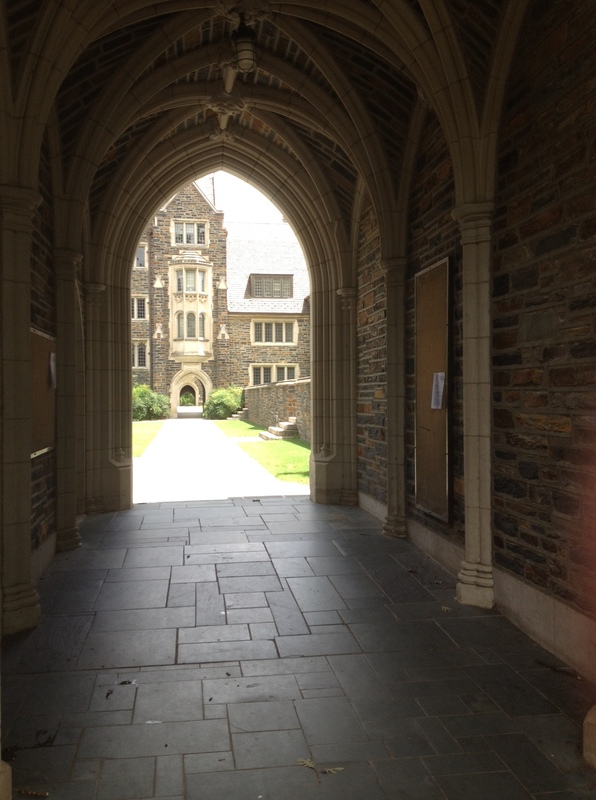 And yes, Duke does look like Hogwarts (strong Harry Potter theme with the owl too!) 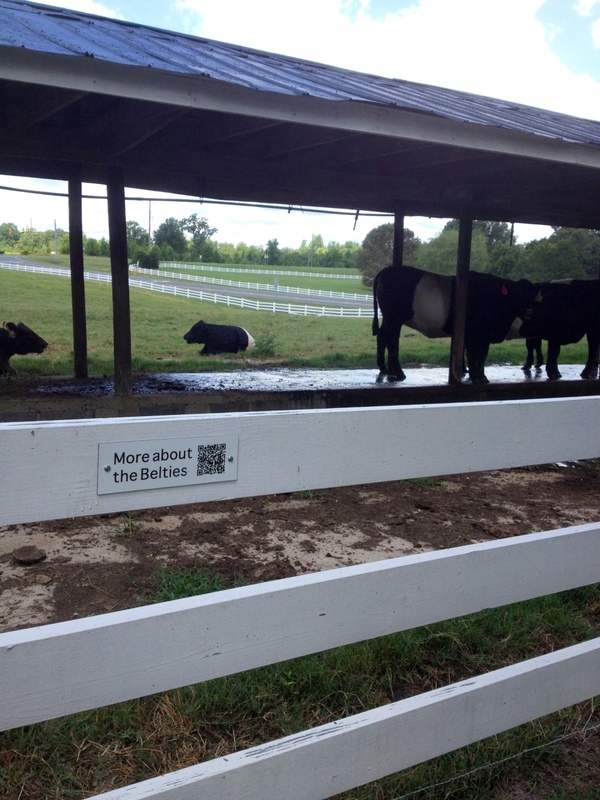 We have “oreo” cows right down the street from our house, they’re cool. The banjo man was very passionate about history and about the restoration of the instruments, and had a wonderful sense of humor! I didn’t know the “oreo” cows were so close to you! 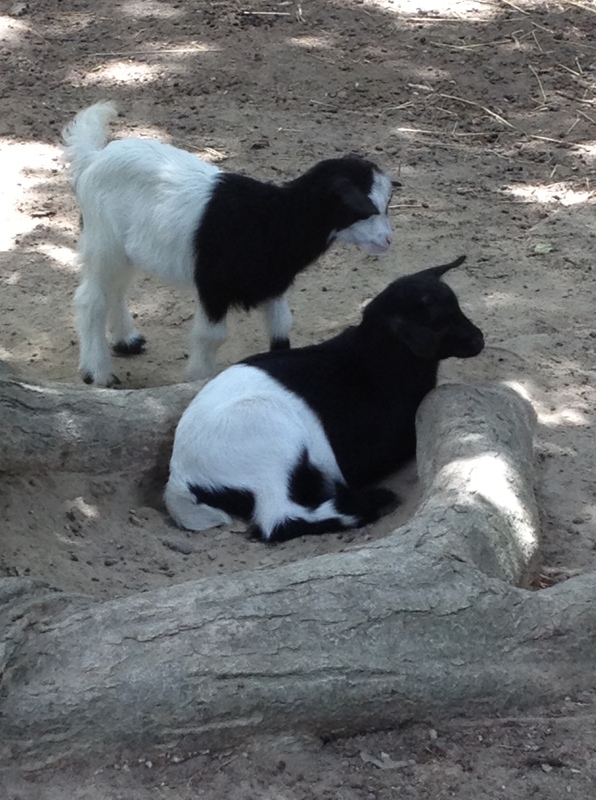 We thought the goats were cute, too! What an interesting and informative trip! I find the most memorable travels are the ones where I learn so much about a specific region; to really learn about it past and pressent! 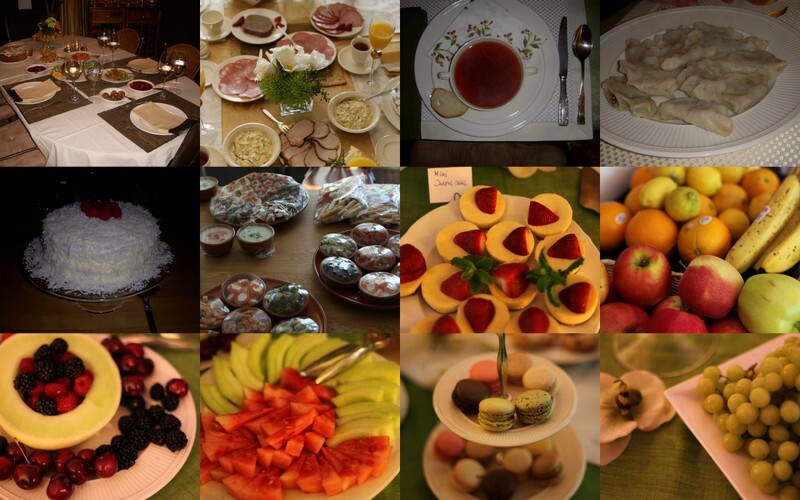 Thanks; we had a wonderful time! I similarly enjoy travel best when it incorporates history and the present! It’s great to be able to see how things evolve.